Carbon Monoxide (CO) Poisoning can be prevented. Never block the combustion air vents. Ensure that all appliances are installed according to code as well as manufacturer’s instructions. Have the heating system (including chimneys and vents) serviced and checked annually. Install a CO detector/alarm on every level of your home. Never use portable, fuel-burning, camping equipment inside a home, garage, vehicle, or tent. Never service fuel burning appliances without proper knowledge, skills, and tools. Never use gas appliances, such as ovens or clothes dryers, to heat your home. Never operate unvented fuel-burning appliances or space heaters in any room, especially not in any room with closed doors and/or windows, or in any room where people are sleeping. Do not use gasoline powered tools or engines indoors. Don’t burn anything in a fireplace or stove that isn’t properly vented. Carbon monoxide is the silent killer, you cannot see, smell or taste it. It’s less dense than air, meaning it will rise and accumulate at the highest point of space. CO poisoning often mimics other illnesses, which can make it hard to diagnose. The first signs of CO poisoning are dizziness, headache, nausea, weakness, vomiting and confusion. Do not ignore, get help. Small amounts are normally produced when an appliance is operated, but excessive amounts can be produced with a faulty or poorly functioning appliance. Under normal conditions it will vent out through the furnace or boiler flue and escape to the outside. But if your furnace or boiler is burning the gas improperly, or the combustion air intake is blocked, a tragedy can occur and it could be fatal. 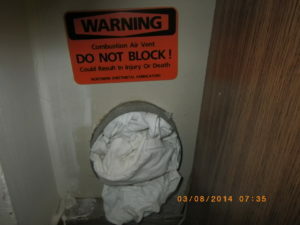 Finding the combustion air blocked on a home inspection happens too frequently. Understanding how your home operates and how to care for your home is just a small part of what we strive to provide each and every client we serve.